My dad was in town last month to work on the house again. He can be very difficult to cook for. My dad doesn't like spices or curries, both of which I love. Since my parents have become much more health conscious these days, a lot of Vietnamese comfort foods like Thit Heo Kho Trung (Vietnamese Braised Pork with Eggs) aren't made often, if at all anymore. But after too many meals of fish or venison, my tastebuds were craving pork or chicken, the latter of which my dad doesn't like either (I told you he was difficult!). 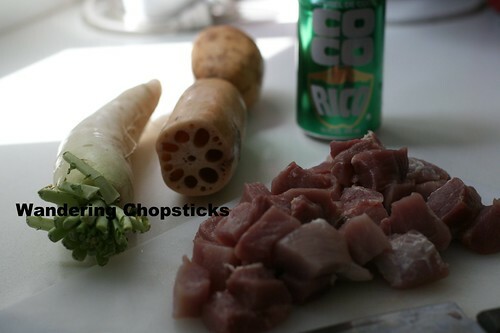 When I spotted fresh lotus roots at the Asian grocery store, I started to brainstorm for recipe ideas. 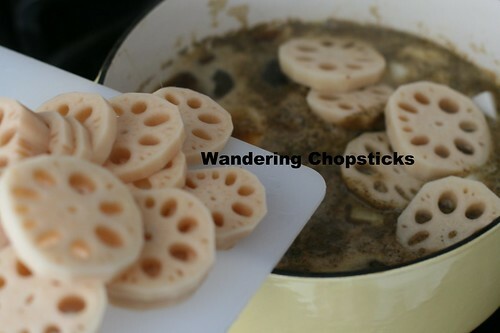 I've made Canh Cu Sen (Vietnamese Lotus Root Soup) before, but that was too simple for what I was craving. 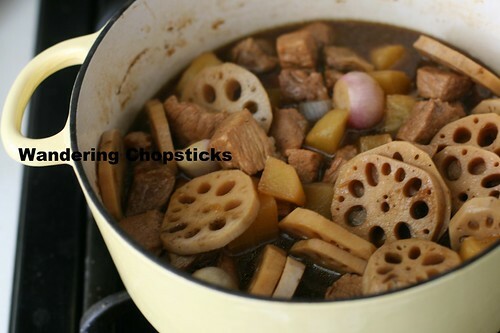 Perhaps I could replace the hard-boiled eggs in the usual braised pork recipe with lotus roots? I spotted daikon radishes on sale too and it seemed like the perfect foil, the freshness of the radish to balance the earthiness of the lotus root. The daikon also helps tenderize the meat. I used a relatively lean cut of pork shoulder for this recipe to keep it healthier, but feel free to use a fattier cut or even pork belly if you wish. I think a bit of Chinese five-spice powder would be lovely as well, but as I said, my dad doesn't like spices so they were omitted. Optional: If you don't want to make the caramel sauce, you can substitute by adding 1 tblsp of Indonesian Kecap Manis. 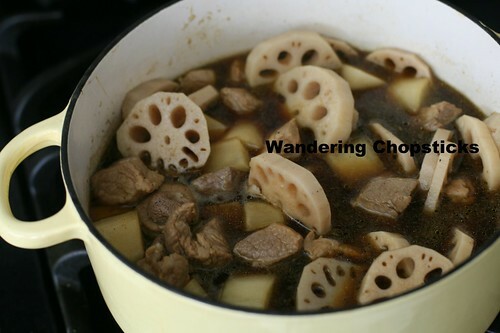 Also, add 1 tsp Chinese 5-spice powder if you wish. 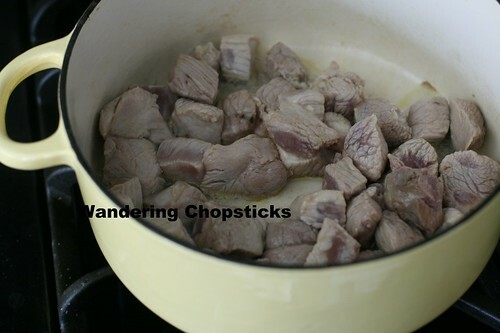 Clean the pork and cut into 1-inch chunks. If you want to be traditional, prepare the Vietnamese caramel sauce. I've been lazy and find the Indonesian kecap manis a great substitute for the same color and sweetness. If you're making the caramel sauce, do that first and then add the pork. 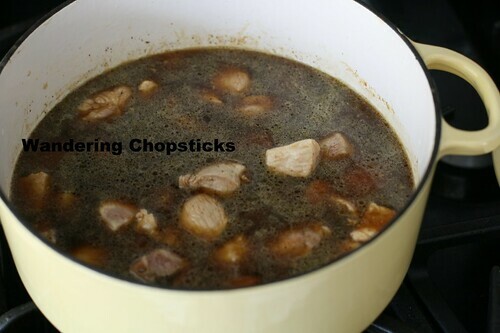 Otherwise, if you're going to substitute with kecap manis, in a 4-quart pot on medium-high heat, drizzle a bit of oil and add the pork. 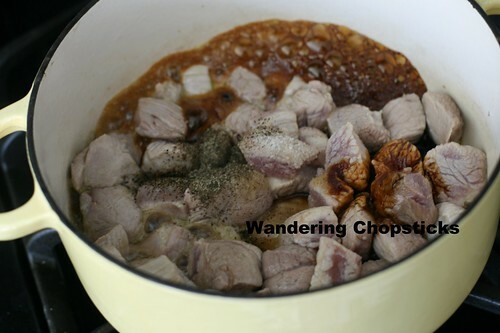 When the pork is mostly browned, add 1 tblsp kecap manis, 1 tblsp fish sauce, 1 tsp salt, and 1 tsp ground black pepper. 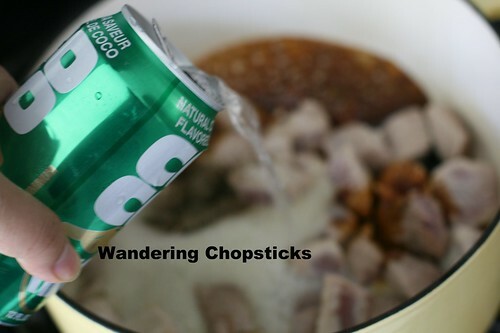 Add a 12-oz can of Coco Rico. Add about 1 cup of water to make sure the ingredients are submerged. 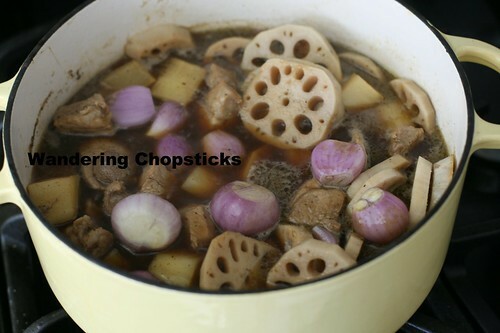 Peel and cut the daikon into 1-inch chunks and add them to the pot. 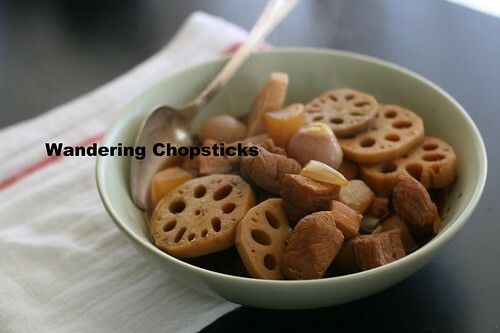 Peel and slice the lotus roots into 1/4-inch pieces and add them to the pot. So pretty! 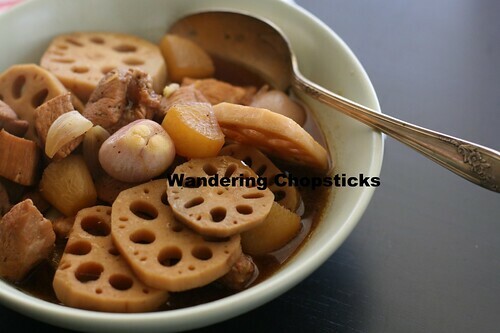 I love lotus roots. 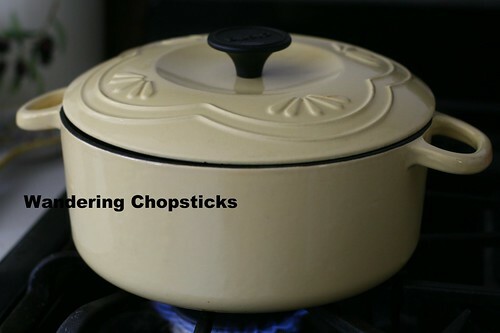 Turn the heat down to medium-low, mostly cover the pot, and let simmer for at least half an hour to one hour. After 15 minutes, I went to check on the pot and noticed shallots next to the stove and figured I'd add in some of those too. 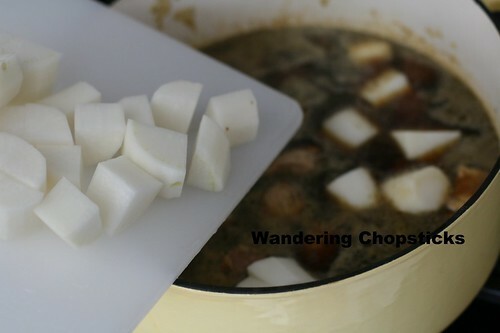 I kept the shallots whole, so they'd be more like the pearl onions I used in my Bo Kho (Vietnamese Beef Stew). 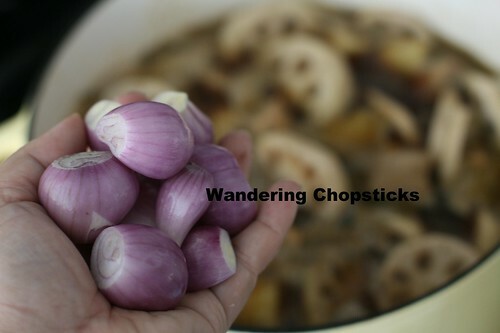 Or you could use a small onion if you don't have any shallots on hand. Loosely cover again and let it braise for another half hour. Do you like my sunny yellow cast iron pot? No Le Creuset for me. I got it at TJMaxx for about $40? Same place I got the red tomato cast iron pot in my Thit Kho Trung recipe and the 7-quart light green oval pot I use for big soups. They've all held up well and I highly recommend them if you're looking for affordable alternatives. I think the price for all three cast iron enameled pots didn't even add up to the cost of one Le Creuset. Anyway, after about 45 minutes total braising time, the pork should be so tender. Serve with rice. Drizzle plenty of caramel sauce over the rice. As for my dad, he still complained. Said shallots aren't for braising, that I should have used regular onions. Oh dad. Hopefully, with a less picky eater. 2 years ago today, Nuoc Mia Vien Tay - Garden Grove (Little Saigon). 3 years ago today, Portland from Glendora rose. 4 years ago today, Lumpiang Prito (Filipino Fried Spring/Egg Rolls). 5 years ago today, Inka Trails Restaurant - Claremont. 6 years ago today, my oldest uncle's wife's banh canh chay (Vietnamese vegetarian udon). Cooking for picky eaters is definitely challenging! When I was at my aunt's house on the day of her daughter's wedding, there were people making bouquets, people getting make up done, bridesmaids returning from getting their hair done -- you get the picture. It was lunch time when I heard my frazzled aunt say calmly to one of the girls, "Oh, that's right, you're vegan aren't you. There's some pasta you can eat." Then, poor thing, she looked at me and apologized for having pasta. It was a warm day and I wasn't the least bit hungry so she needn't have worried. Anyway, your adaptations sound very interesting. I haven't had this kho in so long. My favorite part is the pork skin so I wouldn't fit your parents' "healthy" standards! 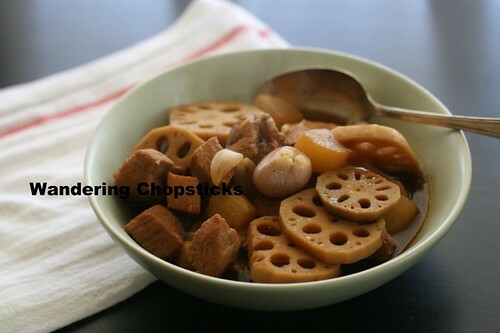 i've never had lotus root before, for some really odd reason i picture it as a loofah for showering and i don't know why. anyway, we don't hit the asian markets often but the next time we do and i see this, i will get it to attempt it. i love thit heo kho. I think wedding cooking is a whole 'nother point! Too many stresses going on already! I love pork belly too, but alas, can't have it very often and my parents hardly ever eat it at all any more. You haven't?! I love lotus roots. Definitely not like loofah. Crunchy, not soft. Maybe you're thinking of one of the other melons? Kecap manis is my all-purpose sauce now. Gives color, flavor, and sweetness. Even if I could afford it, I don't know if I would ever get Le Creuset. I would just think of how many other pots I can get for that same price. Although, I did pick up a brand new small All-Clad pot from the thrift store for $10. Totally worth it, but I sure wouldn't spend more than a hundred for it normal-priced either.